Let's talk #BodyPositivity! Body positive has become the marketing catchphrase of the moment. We see no shortage of brands calling themselves “body positive” through press releases, selectively diverse model choices, and more ad campaigns than I care to count. Media outlets have also been incredibly keen to jump on this bandwagon. They celebrate repetitive, incremental shifts in acceptance and breathlessly post PR copy without giving a second thought as to what it means to write the words “all bodies” in a headline where the text and images suggest otherwise. A Modcloth Swim Campaign from 2015. The company used their employees as models. For example, while researching for this article, I saw several features zealously praising Lonely Label’s ad campaigns as being representative of all sizes. However, the brand’s clothing & lounge size chart stops at a US 10. Their brief and swim size chart goes as far as an XL. To be fair, since it's not the brand making this claim, but rather media outlets, I can’t hold them directly responsible. However, I question the repeated wording. And I do want to give credit where it is due. Lonely has featured model diversity in age, gender, and skin color, but this is rarely done in an intersectional way. Before proceeding, I want to disclose that I do not find the concept of body positivity personally meaningful. I’m a big proponent of intersectional fat positivity, which is concerned not just with fatness, but where it lies at the intersection of other marginalized identities. Additionally, body positivity is blatantly lifted from fat acceptance while pushing fat people out of the picture. 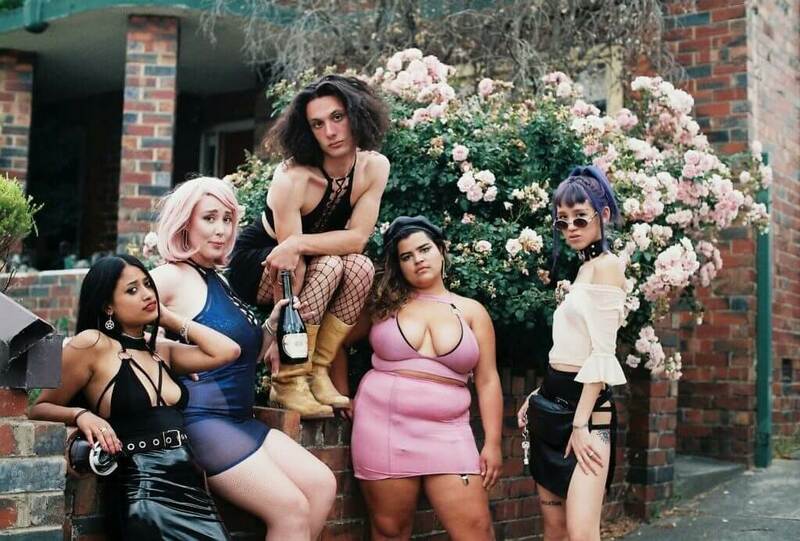 I think the current body positive movement is too focused on appeasing individual feelings over more meaningful actions like uplifting society’s marginalized, underserved and underrepresented. As far as I'm concerned, body positivity doesn’t have a set of well-defined goals or beliefs (and people frequently exploit this for personal benefit). So I’m defining brand-driven body positivity as meaningful representation and product choice for a wide variety of bodies. This does not just mean size and shape; it also means the consideration of race, skin color, gender, age and disability. I also write this with the full understanding that businesses are just that - businesses. Most brands don't have the flexibility to operate solely as a labor of love, but at some point it becomes the right of consumers to interrogate what marketing buzzwords (especially those co-opted from activism) really mean. Lane Bryant’s I’m No Angel Campaign - This campaign uses plus size models, but all with a similar body type representing a disconnect from the plus size customer which includes a variety of body types. My question is this: What makes a brand more body positive than its counterparts? After a Twitter discussion where I expressed my exhaustion with yet another piece celebrating a “body positive brand” I couldn’t wear and a lookbook free of models anywhere close to my shape and size, I created a hypothetical scenario to tackle this question. In this scenario, I discuss two small, fictional brands composed of several elements from different brands. My inquiry is meant to encourage general thought around the question, not draw direct attention to any one, particular brand. Small Brand A: For a nominal fee (to account for fabric, additional labor, or pattern creation), this brand offers custom sizing and design options to cover bodies not included in their off their rack size chart. Their lookbook and product page model choices are not diverse, but they acknowledge the diversity of their custom clients on social media. Small Brand B: This brand uses models with some elements of diversity and the brand receives praise for their lookbooks and touts their own body positivity. This brand’s sizing ends at a US 12 and they do not offer custom sizes or design. So which of these brands is more body positive? And, as a result, which one would I patronize? While I do think it's useful for brands to use models reflecting their full size range, even if it is a small size range, I don’t think it’s enough when attempting to reach and sell to plus size consumers. It’s further complicated because the brands frequently use the same mainstream plus size models. I do have a problem with brands, like Brand A, not doing a better job of advertising their (larger) custom sizing. However, I ultimately settled on Small Brand A as the company to which I would give my praise and money. Small Brand A has built the opportunity for growth and willingness to serve a wide range of customers into the foundations of their business. It isn’t ideal that customers who don’t fit the size chart cannot see themselves in the product outside of social media, but I understand small businesses sometimes have limitations regarding what they do in production or for model selection. I can also imagine people would not be thrilled with paying a surcharge to accommodate their body. However, businesses, especially smaller ones, operate on narrow margins. I’m willing to shoulder the initial burden if it means a brand that wants to include bodies like mine will survive and grow. Ultimately, I’m not sure how meaningful any of this focus on body positive businesses actually is if it never trickles down to an increase in product availability for a wider swath of people. Practically, what is actually the most important part of body positivity movement? For example, I can’t remember the last time Lane Bryant (a notable brand that has, until recently, been very self-congratulatory regarding their body positive ad campaigns) extended their size range upward. American Eagle’s Aerie line is frequently is touted as an example of body positivity in advertising, but most plus sized bodies are sized out of their product and their few “plus size” models are all white, hourglass or pear shaped...and not even the largest size they carry. Screencap of a Brit & Co. feature on body positive lingerie brands. The phrasing of all shapes and sizes feels more than a little misleading. Photo credit: Brit & Co.
We praise brands like American Eagle for not using Photoshop, but how useful is this if you still cast models that “don’t need” to be edited? What is the actual benefit of this type of marketing if it comes with a refusal to make larger sizes or jokes at the expense of the concept of men embracing their bodies? Is it meaningful for a brand to produce one-off imagery using a range of bodies not normally reflected in their advertising, with no long term commitment to doing so? What does it mean when Swimsuits For All produces a "body positive," influencer-led swimwear collection in sizes 10 to 20? What about when they expand sizing mostly downward to make the range sizes 4 to 22? What sort of responsibilities do brands have to those to whom they are marketing? What are your rights and responsibilities as a consumer? At what point should brands stop being praised for doing minimal work while cashing in for maximum profits? At what point should you, the consumer, demand more? I know my body positivity brand fatigue is caused largely in part by seeing things celebrated, but realizing, as an unambiguously fat black woman that isn't shaped like an hourglass, bodies like mine are still excluded - from a visual or product availability standpoint. However, I don’t think that undermines my viewpoint because I am allowed to want more. Writing this piece has further crystallized my own ideas about about what I want as a consumer and how I want to spend my money. I don't find myself capable of advocating an explicitly anti-consumerist ideology because I do like to shop and I feel like there's power in being able to adorn my marginalized body with beautiful things. Yet researching this piece and paying attention to these larger trends has made me more conscious of the fact that advertising, even when it claims to be body positive, tells a story about who a brand wants their customer to be. And if I'm excluded from the narrative, then I need be equally exclusive with my dollars. A Lingerie Icon’s Last Gasp: Can Megan Fox Save Frederick’s of Hollywood? Bras and Bankruptcy: What’s Going On At Agent Provocateur? I really like this piece. I only buy lingerie from brands that use black models. I tried to extwnd that to dark skin models but wiyh a larger bust size that would only be 2 brands.. I think Lonely and JBC do well with their diversity tho LGBT representation is not included. JBCO at least does custom sizing similar to Tpru and Naoko who just recently got a dark skin model. Thank you for saying all this! I am a very plus sized woman who has issues with even Lane Bryant’s fit at times. So many labels claim to fit all, but they’re nowhere near fitting me. I know no company is obligated to make things to fit me, but they could all improve on there language and images. I noticed every single one of those images failed on age, in addition to the other things mentioned. As long as companies are still thinking of diversity as boxes that need to be checked, instead of having a broader conception of their customers, most of us probably won’t see models that we can relate to. A fantastic thoughtful piece. I knew many of the campaigns I’d seen were problematic, but I’d not really thought that hard about why. Think I’m going to take “body-positive” out of my social media bios as the phrase doesn’t really mean what I want it to mean.